This base of the U.S. Air Force, is located on the outskirts of the city of San Angelo, in the northwestern part of the state of Texas. Base's history started when President Franklin D.Roosevelt began a program of preparedness which included the construction of facilities dedicated to advanced air training. Construction of the new San Angelo Air Corps Basic Flying School began at once. Officially established on 17 August 1940, the base was ready for occupancy by 21 January 1941 and the first classes of students soon arrived. On 11 June 1941, the base was officially renamed Goodfellow Field, after 1Lt John J. Goodfellow, Jr. native from San Angelo who lost his life on duty in France during the World War I. The next four years witnessed the graduation of more than 10,000 trained pilots whom participated in war action against the axis forces. After the war, Goodfellow continued to train pilots, first on the AT-6 "Texan" and then, beginning in 1954, on the twin-engine B-25 "Mitchell." On 3 September 1958, with nearly 20,000 aviators to its credit, Goodfellow graduated its last class of pilots. During the first years of the 1950 decade some isolated balloon launches were performed at San Angelo (althought we had not sufficient information to assure that them were launched from Goodfellow AFB) as part of cosmic ray studies carried out by several Universities. However the most important balloon activity at the base started in September 1958 when was activated there the Detachment 160, 1110th Balloon Activities Group. 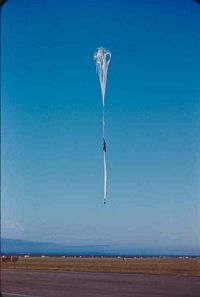 Initially assigned to Lowry Air Force Base in Denver, Colorado the detachment mission was to launch, monitor and recover helium-filled, polyethylene straospheric balloons. The activities at Goodfellow were carried out under the auspices of a program for collecting samples and atmospheric particles for the Atomic Energy Commission (AEC). This operation was designed to measure the presence of various radioactive components in the stratosphere, generated by the various atomic tests conducted worldwide. 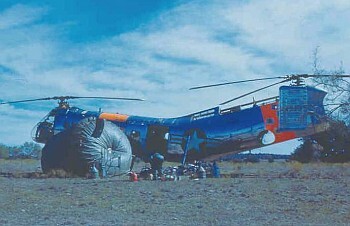 Being a sampling programme, the recovery of the payload after each flight was vital, so the unit had a wide variety of planes and helicopters to be used to closelly follow the balloons and acomplish the immediate recovery of the gondolas once on the ground. Initially launches were made from inside the base, but starting in June 1962 the unit began to use other sites in the state as Pecos, Monahans, Brownwood, and the brand-new permanent station of the National Center for Atmospheric Research (NCAR) in Palestine. It also made operations in the state of South Dakota along the parallel 45º in Rapid City and Sioux Falls. For 1964, the unit also incorporated as launch sites Eielson AFB (Alaska), Albrook AFB (Panama) and two years later the city of Natal in northern Brazil. On 31 July 1971, Detachment 31, 6th Weather Wing (the denomination of the 1110th at that time) was inactivated, bringing Goodfellow's balloon mission to a close after the launch of more than 1300 balloons. However, three years later, in May 1974, the base supported a final balloon experiment cosponsored by the University of Wyoming and the NASA Called LACATE. That was the final balloon mission from Goodfellow AFB. A year later the base runnways were permannetly closed. Nowadays Goodfellow remains open as an active military base of the Air Force which serves as a training installation subordinated to Air Education & Training Command, although without any flight operations. Page generated on 3-Dec-2018 - 09:59:15pm © StratoCat 2005~2017 - All Rights Reserved.